Call them punks… call them animals… but you better get out of their way! They’re souped-up for thrills and there’s no limit to what they’ll do! Once Tom is comfortably ensconced at home with his wife and two children, teenage Tina (Laurie Mock) and young Jamie (Tim Stafford), he must consider his family’s future. With his bad back, Tom can no longer cover the territory his old job required. Bill proposes a new business opportunity, owning and operating a desert motel. They’re the kind of animals that wear button down shirts and freshly-pressed slacks. Only in 1967 could these kids, who dress like young Republicans, be considered outside the norm. Duke (Paul Bertoya) the de facto leader of this wild bunch, can’t keep his hands off freaky chick Gloria (Mimsy Farmer). She asks the eternal question, “What’s left for kicks?” After some swell hot roding antics (close-ups are achieved using old-school rear projection techniques) Duke and Gloria engage in some heavy social recreation. When the family car has a blowout, everyone is a bit rattled. “Let’s not go being too dramatic,” Mother quips, despite the fact that it’s all they’ll be doing for the rest of the movie. At a nearby service station, Tom gets to talking with the station attendant about the motel and his plans for the future. Ernie (Gene Kirkwood as another well-dressed “hoodlum”) overhears their conversation and fills Duke in on the situation. It seems that the motel and its adjoining roadhouse, The Arena, are the only places for disenfranchised local teens to hang out. There’s no telling what a square like Tom Phillips will do to their favorite juke joint. Tom, who’s chosen this particular moment to try and overcome his fears, takes the wheel of the family car only to be terrorized by Duke and his pals. The kids taunt and tease the Phillips family with their vehicular antics along vast stretches of uninhabited desert highway. What makes the scene so enjoyable isn’t the impressive stunt driving, but the reactions from Hollywood veterans Andrews and Crain. While his family is being menaced, Andrews is stony-faced but sweaty while Crain shrieks, gasps and overacts wildly. Accompanied by frenzied go-go music, the teens literally drive circles around old man Tom. “Tom, we’ve got to get away from them,” Peg pleads, overstating the obvious. They find refuge at a particularly verdant picnic area that has trees, grass and even a lake! Just the kind of place you’d expect to find in the middle of the desert. The family is able to eat their lunch in peace while dad rests his back. With Duke and his gang long gone, the Phillips family continues their trip. They arrive at the motel to find the adjoining “coffee shop” really jumping. They quickly get settled in for the night but Tina sneaks out her bedroom window. It seems she can’t resist the siren song of Mickey Rooney Jr. and his combo. She finds Ernie and Gloria, who Duke refers to as “stale bread”, getting groovy on the crowded dance floor. Gloria makes a scene when she sees that Duke is interested in Tina, a girl who is apparently bakery fresh. Though The Arena obviously sells alcohol, Duke and his underage pals seem to make due with soda pop. In a brief scene where Duke sits at a table, an awkward black bar obscures the brand name on the bottle he’s drinking from. It seems that a certain national bottling company didn’t care to be associated with the immoral hooligans of Hot Rods to Hell. This hits a little too close to home for Peg. She gives her daughter a well-deserved slap before dispensing some motherly advice, “Tina, there isn’t a woman alive who doesn’t want a man, but you’re young enough and desirable enough to demand that a man love you if he wants you.” In other words, get a ring before you give up the goods. It isn’t long before Duke and Ernie catch up to them on a lonely stretch of highway. The boys continue to terrorize the Phillips family, each of whom indulge in their own unique style of histrionic overacting. A deserted roadside diner offers them a respite from the games of chicken. After a brief confrontation with the hooligans, Tom realizes that if he’s going to fight back, it has to be on their terms. Tom parks the car on a narrow bridge and, under the cover of night, hides his family in the desert away from any danger. Duke and Ernie speed toward the family car for one final game of chicken. They realize too late that the car isn’t moving and swerve to avoid a collision. They roll their rod off the road and into a ditch. Tom waves a tire iron like a crazy man, but soon has a dramatic epiphany. He realizes that he had the fortitude to stand up to these punks all along. In a speech reminiscent of Scarlett O’Hara’s vow to rebuild her ancestral home, Tom tells the boys, “I’m not going to run anymore. I’m going back to my motel and I’m gonna clean up all the slop and garbage and the smell and it’s gonna be like it should be. And I won’t even need the police.” The police show up anyway and take Duke and Ernie away. It may have been a deeply traumatizing experience for them all, but the Phillips family is closer and more wholesome than ever. “Peg,” a newly liberated Tom tells his wife, “I wouldn’t even mind if you drove now.” Everyone piles into the station wagon for the drive back to their own little piece of the American dream, a roadside motel in Mayville, USA. 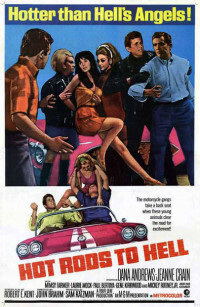 In conclusion: Hot Rods to Hell was originally made for television in 1966. It was shot quickly (about two weeks) on the MGM backlot and in the areas surrounding Palmdale, CA. The producers were so pleased with the end result that they changed the title (it was originally called 52 Miles to Terror) and released the film theatrically. The same year that Hot Rods to Hell was released, Gene Kirkwood, Laurie Mock and Mimsy Farmer appeared in another teen flick, Riot on Sunset Strip (1967). In that film the girls got to switch roles. Mock played a groovy beatnik chick while Farmer played a naive daddy’s girl who goes on an outrageously entertaining acid trip.